When a remastered version of Grim Fandango was announced at E3 last month, my heart skipped a beat. And then it broken when there was no mention of a PC version, only PS4 and Vita. The pieces were put back together again when Tim Schafer tweeted that other platforms would be talked about soon. Today, Double Fine has announced that PC, Mac and Linux versions of the classic adventure game would release alongside the Sony’s consoles. And all is right with the world once more. 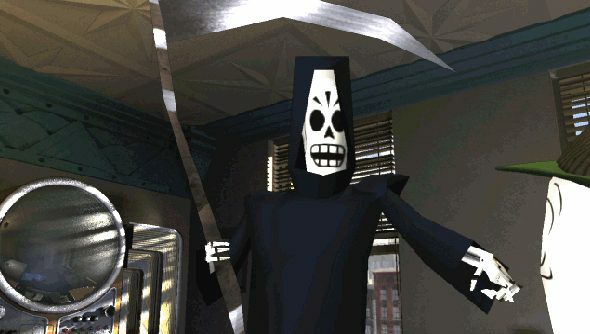 Despite critical acclaim, Grim Fandango did not sell very well 16 years ago. Its commercial failure heralded the death – thankfully temporarily – of adventure gaming, with LucasArts giving up on the genre and Sierra following suit. But it was great. And it seems like now is the perfect time for its resurrection, as appetites for adventure games have increased. Since it isn’t available through any digital platforms like GOG, the only way to get a copy was to find a physical one, and it wasn’t exactly designed for modern machines. So we can say goodbye to compatibility issues, and maybe even get some updated controls instead of relying on mods. I look forward to it gracing my PC once more.